Relatively few cheese varieties are dry salted but a high percentage of the world's cheese production is dry salted! This discrepancy can be explained by the fact that Cheddar, the variety produced in the largest quantity, is a dry-salted cheese. 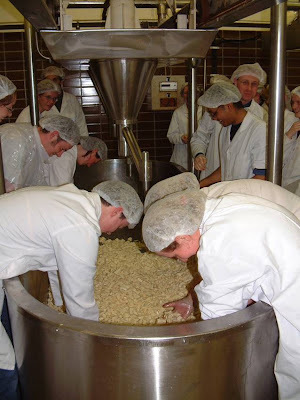 In dry salting, the curd is milled (cut) into small pieces at the end of acidification and dry NaCl is sprinkled on the surface of the curd chips. NaCl dissolves in whey on the surface of curd chips and diffuses inwards (in effect, each individual curd chips is "brined" in its own salty whey) and each curd chip acts as a "mini-cheese". The milled curd chips have a very large surface area: volume ratio which leads to very rapid uptake of salt in Cheddar and related varieties. As high salt-in-moisture inhibits the growth of starter organisms, it is important that the curd has achieved close to its final pH before dry salting. Mellowing time: Salt uptake increases as mixing time increases from 20 s to 6 min. Holding time between salt addition/mixing and pressing: Uptake increases as holding time increases. Curd temperature: Uptake decreases as curd temperature increases from 24 to 41C (this effect is largely due to increased liquefaction of milkfat at the surface of the curd chips which inhibits NaCl uptake). Surface area: volume ratio of curd chip: NaCl uptake increases as surface area is increased (i.e., by reducing chip size). Curd moisture: NaCl uptake decreases as curd moisture increases. As moisture increases, there is more syneresis of press whey which removes more NaCl from the chip. Curd acidity: Salt uptake decreases as acidity decreases (i.e., lower uptake at higher pH). Guinee, T.P. (2007). What factors affect salt uptake in cheese curd? In Cheese Problems Solved, P.L.H. McSweeney (ed), Woodhead, Cambridge, pp. 87-89.